Buhari yet to arrive Nigeria two days after leaving U.S.? President Muhammadu Buhari’s whereabouts appears shrouded in mystery, two days after he left Washington following a bilateral meeting with President Donald Trump. The president was expected home on Wednesday but didn't arrive. 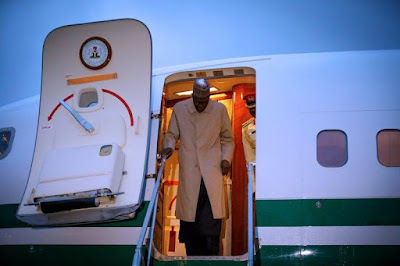 Buhari’s official aircraft, Eagle One, left Joint Base Andrews military airfield in Washington on Tuesday morning and arrived in London at 9:42 p.m., according to Flight Radar 24, which tracks air traffic across the world. But as at 10:00 a.m. Thursday, the aircraft was still in London amidst unclear circumstances. An April 27 State House press release which announced Mr Buhari’s scheduled take-off from Nigeria on May 28, did not say he would stop by in London. PT reached out to senior presidential spokespersons Femi Adesina and Garba Shehu to clarify the president’s whereabouts. None of them responded to phone calls and text messages about the matter as at Thursday morning. Recall that Buhari was treated for an undisclosed ailment in London for months between 2016 and 2017.